"A yummy dog treat especially for holidays." Preheat oven to 300 degrees F (150 degrees C). Lightly grease a baking sheet. Stir together the egg, peanut butter, banana, and honey in a medium bowl; blend thoroughly. Stir in the flour and wheat germ; mix well. Turn dough out onto a floured board and roll to 1/4 inch thick. Cut into desired shapes with a cookie cutter, place on prepared baking sheet, and brush tops with egg white. Bake biscuits in preheated oven until dried and golden brown, about 30 minutes, depending on size. Remove from oven and cool on a wire rack. 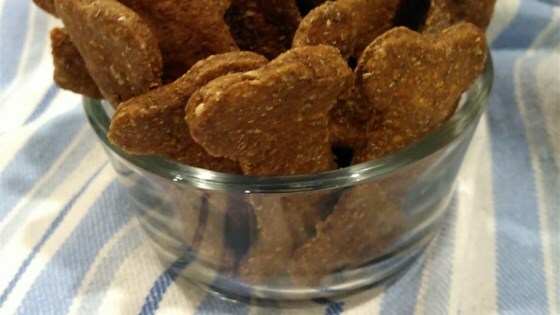 Your dog is sure to love these biscuits, made with peanut butter and banana. The picture that accompanies this recipe is deceiving and it may be carob coating, which is OK, but NEVER EVER dip your dog cookies in chocolate. Chocolate is very toxic to dogs.